This free healthy grocery list is full of everything you need for wholesome eating. ...and which name brands get my dietitian stamp of approval! Peruse the healthy shopping list below or print and carry the downloadable healthy grocery list (here) with you. 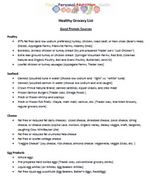 Use this free grocery shopping list to stock your fridge weekly with the proper healthy foods. After all, you can't eat right if you don't have the right foods on hand. And you won't have the right foods on hand if you don't shop. Tips--->Buy 2-4 different fruits/week. Buy in varying stages of ripeness (ex: buy green bananas as well as yellow bananas). Any fresh fruit you'll eat. No sugar added applesauce, pearsauce, fruit cocktail, pineapple, peaches, mandarin orange cups, etc. Tip--->Buy 2-4 different vegetables/week. Avoid buying more than you'll eat. Frozen veggies you love: onions, bell peppers, asparagus, broccoli, cauliflower, carrots, etc. No more than 1 gram of saturated fat per 100 calories. No more than 3 grams of total fat per 100 calories. No more than 200 milligrams of sodium per 100 calories. I hope my free grocery shopping list helps you! !